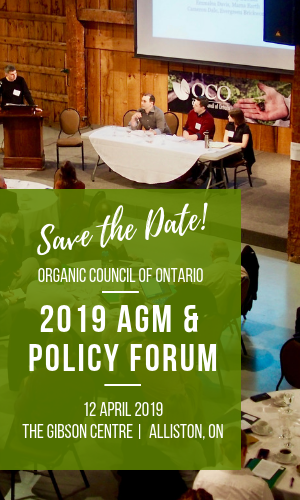 Jenn Pfenning attended the screening of In Organic We Trust as part of the Planet In Focus film festival, representing the Organic Council of Ontario and to provide an Ontario perspective to the audience of 120+ individuals who viewed the screening. The audience asked questions about certification and what they can do and Jenn was able to provide them answers and direction. The audience was so engaged that not all questions were able to be answered because the venue was booked for another film shortly after, but Jenn encouraged them to continue asking questions about their food and continue talking to us though our website and social media networks. Elizabeth & Jenn attended the Nutritionists Networking Group – Toronto and delivered a presentation to a group of Holistic Nutritionists on the importance of supporting Ontario organics. While the presentation was meant to be 1 hour, they spent close to 2 hours in discussions and answering many questions relating to organics. This is an important audience since Holistic Nutritionists play a tremendous role in teaching their clients healthy eating habits which includes a diet rich in organic whole foods. A box containing 200+ informational pamphlets were offered to the nutritionists to distribute to their clients in effort to help them help their clients better understand the benefits of supporting local organic and they were very quickly scooped up. Hosted the third and final dinner at Garden Party Farm as part of the Ontario Organic Dinner series. Close to 40 people attended the dinner which turned out to be another incredibly inspiring event. Theresa Schumilas, owner and operator of Garden Party Farm, toured dinner guests around her farm and answered many questions relating to organic farming and her CSA farm operation. Matt Lebeau, addressed the crowd with an update on the state of organics in Ontario and the importance of supporting the sector. Chef Christopher Jess inspired us all as he described his efforts at the Food School, Centre Wellington District High School in teaching students about the origins of food and in creating a sustainable organic farming program that students can take towards their high school credits. OCO’s Maureen Kirkpatrick helped organize an event at The Big Carrot with guest speaker Lucy Sharratt, the Coordinator of the Canadian Biotechnology Action Network (CBAN), a campaign coalition of 17 organizations including farmer associations, environmental groups and international development organizations, all of which have various concerns about genetic engineering. Lucy spoke to a standing room only crowd of citizens on the pervasive myths that about Genetically Engineered foods as well as the threat of GM alfalfa to family farms and in particular to organic dairy farmers. Jodi Koberinski also had a busy week, working abroad from India. Jodi completed the Local and Organic Messaging Strategy under the CAAP project, provided recommendations for Science Cluster projects to ensure research dollars come to Ontario, interviewed Phil Bereano, lawyer and activist working on the Biodiversity Convention following the meetings in Hyderabad, executed Campaign for Seed Freedom in cooperation with Vandana Shiva and the Navdanya Institute and developed funding application for Trillium Foundation to develop supports for youth social enterprise withint he organic sector.